Hindi ako qualified dito. Up ko na lang yun post para sa mga qualified. Wait, Naka-post na din ba ito sa official PPS FB page? Parang sa groups ko lang nakita. Mukhang hindi ko ata na-post sa page. Sige, post na lang din natin para dagadag exposure. Will you guys be active din for the modern warfare remake and infinite warfare? Add me up. already preordered a digital copy. ^Yes sir we definitely will! xgh0st12x wrote: Will you guys be active din for the modern warfare remake and infinite warfare? Add me up. already preordered a digital copy. I added you na sir, please accept it nalang so we can invite you to play with us which will also act as your assessment as well. Thanks sir! 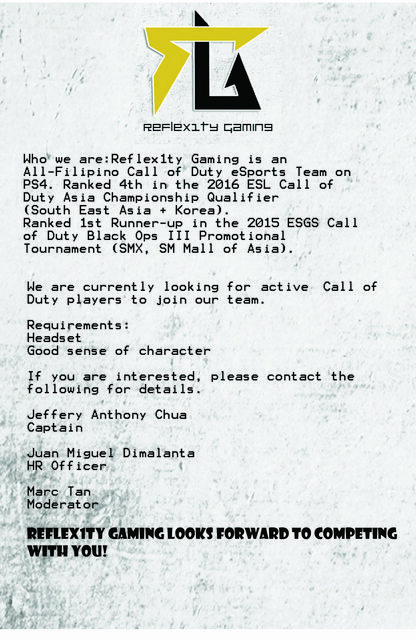 Hey guys I just wanted to give you an update, xgh0st12x and babols are now members of Reflex1ty Gaming! However our recruitment efforts still continues, with the upcoming release of Infinite Warfare and Modern Warfare remastered, we are now looking for additional members so that we could form a Modern Warfare Remastered team! So please don't hesitate to inquire by sending me a pm if you are interested. Thanks! Magaling yang 2 members na yan.